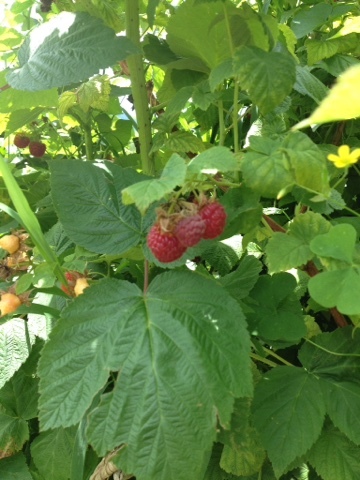 After a trip to pick berries, I block out time to quickly process the fruit. When picking at it's peak, berries will turn from perfect little sweet jewels to moldy mush in a matter of hours or days at best. So it's smart to reserve what you can eat fresh and then freeze the rest. Freezing berries is very simple. If you suspect that your fruit has bugs or pesticides, gently wash it. I don't pick from places where this is an issue and am able to avoid this step. If you do wash your berries, you need to let them dry before you proceed. Lay them on towels that you are okay with getting berry stained. Then simply lay your fruit on cookie sheet pans in a single layer. Sick the pan in the freezer until all the berries are frozen solid. 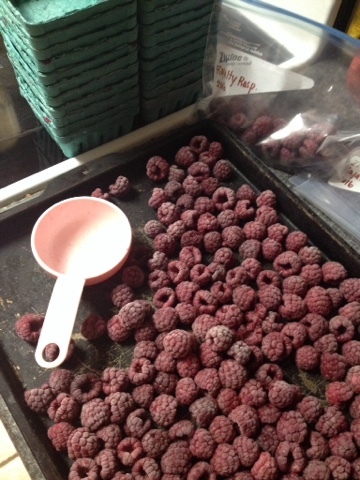 Finally, scoop the now frozen berries into baggies that are well labeled and put back into your freezer. 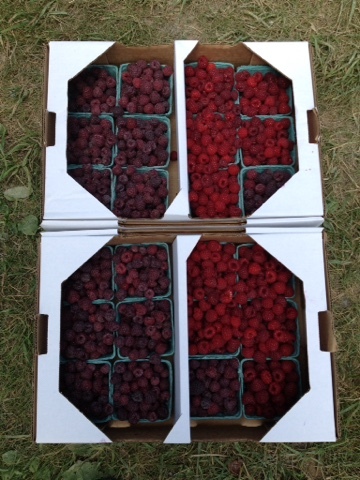 Now you have a freezer full of perfect berries, picked at their peak, ready to be used in muffins or scones or pancakes or breads or smoothies or my personal favorite, right out of the bag, still frozen, topped with a bit of half and half or cream. Do you ever pick your own fruit and freeze it or preserve it? How do you like to use up your frozen berries?